We do not pick you up at your hotel or villa. You meet us at the rental location. Smith's Reef is made up of several small coral heads next to each other. The shore can be a bit rocky when entering and leaving the water. 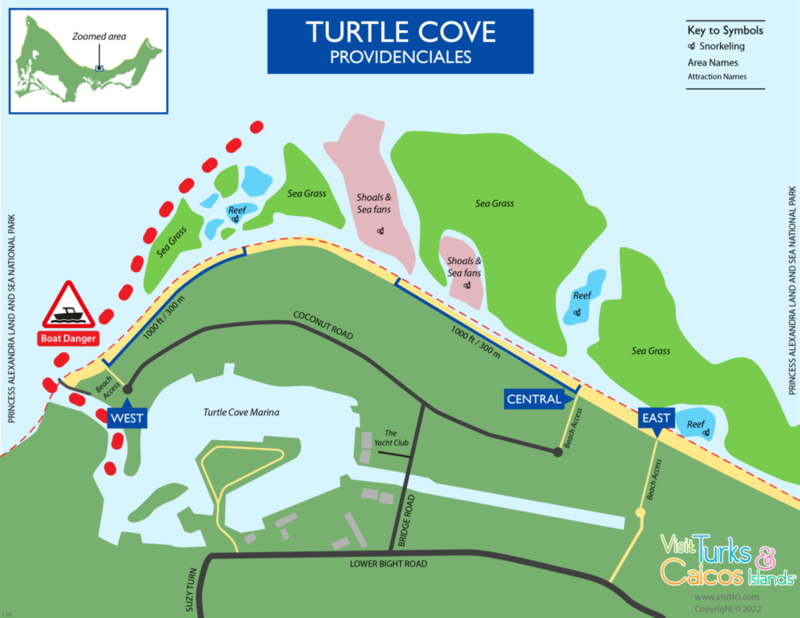 Because the reef is located near Turtle Cove marina, there will usually be some waves created from boat traffic entering and leaving the marina. Tidal currents can also be stronger here. Due to these conditions, we recommend that less experienced snorkelers choose the Bight Reef. The place to park at Smith's Reef is not marked well. To find it, head towards the Turtle Cove area and turn down Bridge road. Follow Bridge road towards the Yacht Club resort. Hang a right at the fork (onto Coconut Road) and keep going past several houses before coming to a parking area for beach access. There are only a few parking spaces and it looks like you are parking in front of someone's house. 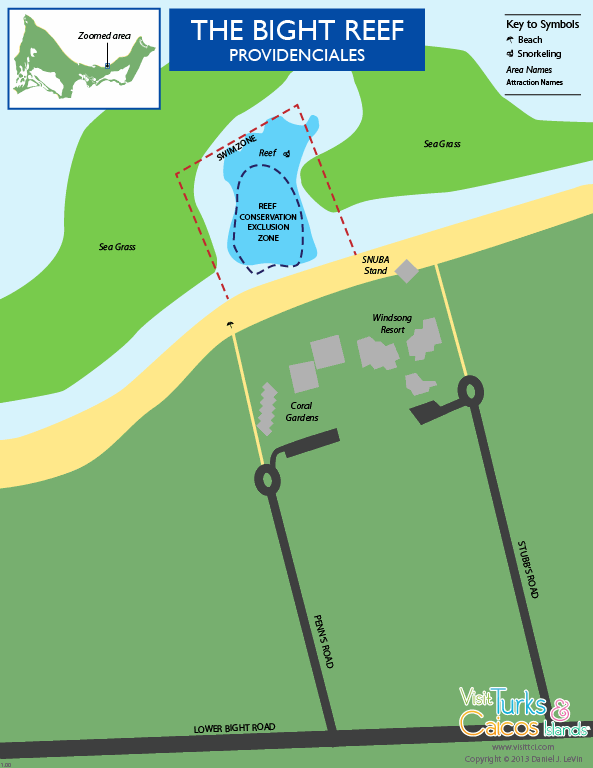 There is a small yellow sign for "Beach Access" next to the path to the beach. You can look at this map and should park at the area labeled Central. Once on the beach, hang a left and keep walking until you see a person wearing a bright orange shirt with a beach cart. We will meet you on the beach where it is best to enter the water. The walk from where you park your vehicle to the spot you enter the water is takes a few minutes so please plan accordingly in order to get your full 50 minutes in the water. The Bight Reef is one large reef that is roped off in the center. The roped area is protected so you cannot swim within the roped off area. Don't worry though. There is plenty to see around the edges of the protected area. Entering and exiting the water at the Bight Reef is easy via a nice sandy dune. We will meet you on the beach near the roped off reef area. Look for the person wearing a bright orange shirt with a beach cart. The Bight Reef tends to more popular with snorkelers because it is on Grace Bay Beach near several hotels. You will see more people on the beach and in the water at this location. To park at the Bight Reef, head towards Somewhere Cafe at Coral Gardens hotel, and park on the side of the road when you reach the roundabout. You can see the parking area on this map and you will see other cars parked at the entrance to the beach near the parking lot for the Coral Gardens hotel. Both locations have beautiful corals, colorful reef fish, lobsters, turtles, barracudas and you might be lucky enough to see the occasional nurse shark or sting ray cruise by. For more about what you might see, check out the Snorkeling from Shore page. Also the VisitTCI website has additional information for both locations. A seascooter is a motorized device which propels you through the water. A seascooter is easy to use. You hold it with both hands and press a simple throttle control on the handles in order to move through the water. We also provide you with fins, mask and snorkel as part of the rental. If you want to use your own snorkel gear that is fine too. Please let us know that when you book your rental. There is an action camera attachment for GoPro or similar type of cameras on the seascooter, so please bring your action camera in an underwater housing, if you have one! The water temperature is usually between 79 - 89 degrees. The water is typically clear with visibility of at least 50 feet or greater, but there are days when the water can be a little less clear. You will still be able to see the reefs just fine as both are close to the surface. This is the ocean so there will be some waves and currents at both locations. We do not recommend a novice swimmer or snorkeler operate a sea scooter. We do not accompany you in the water. You must know how to swim and this should not be the first time you try snorkeling. Children must be over the age of 8. Children must be able to swim independently. When booking a scooter for a child on our website, we define child as 8 - 15 years old because a child over the age of 15 will typically need to use an adult size scooter. There are creatures, corals and objects in the ocean which can hurt you. Do not touch anything and use caution. We can only accommodate groups of 4 people or less. The seascooter has a leash which goes on your wrist. This is in case you unintentionally let go of it. It should stay buoyant, but may drift away from you. Do not take off the leash while in the water for any reason. You are responsible for returning the seascooter, undamaged, back to us at the end of your rental. We do NOT pick you up at your hotel or villa. We bring the equipment to the beach and meet you there. The weather in the Turks and Caicos Islands is typically beautiful. Keep in mind that these are small islands so the weather can change rapidly. It can be raining in the morning and sunny in the afternoon. Check the weather prediction for the day of your rental. The VisitTCI site has a detailed view of the weather. If you decide to cancel your reservation due to weather (or any other reason) you must call us at least 24 hours in advance to receive a full refund. We recommend reserving your rental seascooter in advance on our website. The website will charge your credit card at the time of the reservation. We use PayPal as our credit card processor. You do need to create an account login with PayPal, but you pay using a credit card. You should receive a confirmation email including the date, time and location of the rental as well as an email receipt from PayPal, confirming your payment. If inclement weather is predicted for the day of your reservation, we will cancel the reservation and try to accommodate your reservation on another day, if possible. If you do not see the day or time available that you would like to book, please give us a call at (800) 686-0904 or send us an email webfootersrentals@gmail.com and we will try to accommodate you, if possible. We have a 24 hour cancellation policy for a full refund. You must call us at least 24 hrs in advance of your rental time in order to receive a full refund. Call (800) 686-0904 or email us at webfootersrentals@gmail.com as soon as you know that you will need to cancel your reservation. Should we need to cancel your reservation for any reason, we will issue you a full refund and let you know at least 24 hours in advance. Sorry, but if you do not show up for your rental time, you will not receive a refund. We can only wait 15 additional minutes past the scheduled rental time for you. We cannot wait any longer than 15 minutes without jeopardizing our other customers' schedules. Please be cognizant of the time of your rental and try to show up on time or even 5 to 10 minutes early. Should you realize that you are going to be late for your rental time, please call us immediately at (800) 686-0904. If you are more than 15 minutes late for your scheduled rental time, we will consider you a no-show for the rental. You will NOT receive a refund. Rental rates include taxes. All rentals are for a duration of 50 minutes. (See above section "What is a seascooter" for note about battery life.) We can accommodate up to 4 people at one time. All rentals are for a duration of 50 minutes. Current rental schedule applies to both locations. If you do not see the day or time available that you would like to book, please give us a call at (800) 686-0904 or send us an email webfootersrentals@gmail.com and we will try to accommodate you, if possible. Please try to show up 5 to 10 minutes early in order to get your gear set up and hear a brief tutorial.